In-running pick, Lucas Bjerregaard, holds sway with just a round to go at the Portugal Masters but I'm far from counting chickens just yet. Here's the 54-hole leaderboard with prices to back at 01:20. Bjerregaard has given me a nice run so far and he looks ready to win his first European Tour event but if he's going to convert, he's going to have to confound the stats. The 2014 edition was reduced to just 36 holes so although we've had ten previous renewals, only nine have gone the distance and are any use for analytical purposes. Andy Sullivan hacked up in 2015 - winning by nine strokes, having led by five with a round to go - but Alvaro Quiros, who won the second edition in 2008, is the only other third round leader or co-leader to go on to win. This is a hard course at which to convert a lead and we've seen a couple of winners come from miles back! Tom Lewis and Shane Lowry both trailed by four with a round to go when they won in 2011 and 2012, David Lynn took the title form six adrift in 2013 and Richard Green shot a final round 63 to win from seven back in 2010. If you like taking a chance on a few wild outsiders on a Sunday, this could be the week to do it. Of those towards the head of the market, I quite like Eddie Pepperell and I'm hopefully that my halfway pick, Joost Luiten, can recover after a disappointing third round. His stats have been great all week and I can see him bouncing back. I'm hopeful that pre-event pick, Chris Paisley, who Joe Dyer also picked out for the each-way column, can get involved but I'm certainly not confident. It's still a wide open tournament and it should provide plenty of entertainment. I'm going to try and keep an eye on the early chargers but given it's my wife's birthday I might struggle! Over at the Tour Championship, Paul Casey has shot a couple of strokes clear and three men have opened up a gap on the remainder. Here's the leaderboard with prices to back at 01:25. Paul Casey sounded confident when interviewed after round three but I'm more than happy to take him on. His sole PGA Tour win was eight years ago, he often struggles in-the-mix and we saw yesterday how quickly things can unravel around East Lake. His immediate challengers aren't big names and both began the week at triple-figure prices but even if they flounder, Casey won't be able to cruise to victory. The five players trailing by five or six strokes are all capable of going low and I can't believe at least one of them won't. Anyone that followed Paul Krishnamurty's advice is on good terms with themselves. His 100/1 shot Jason Scrivener is tied for fourth and just two off the lead and this is how he signed off his Find Me a 100 Winner Column. "Finally, Nino Bertasio strikes me as having the right skills-set for this task." Here's the 36 hole leaderboard with prices to back at 09:25. As detailed yesterday, nine of the previous ten Portugal Masters winners have been positioned inside the top-ten at halfway and the odd one out, Richard Green, was only 11th, so it may not be wise to scan too far down the leaderboard. That said, Lee Westwood was four strokes adrift at this stage when he won in 2009 and both Green in 2010 and Shane Lowry, two years later, trailed by five through 36 holes so with such a tight leaderboard (three players are four behind Bertasio and five are five back) we can't be too dismissive of those outside the top-ten. I'm obviously happy with the progress of yesterday's in-play pick, Lucas Bjerregaard, and after much deliberation I've decided to go into the third round with just one more in-play pick. The 2012 champ, Lowry, impressed me yesterday but I couldn't quite find the optimum time to get him onside. He played the back-nine first and after he'd birdied holes two, four and five, it made sense to wait and let him finish up the round. The sixth and seventh are tough holes, eight's a fairly straightforward par three and nine's tricky enough. He parred six and bogeyed seven and I was smugly thinking I'd done just the right thing to hang fire but he then went and birdied both eight and nine! (see below). I thought I'd be adding him at the close of play but after examining the halfway stats I've decided against it. He ranks number one for Greens In Regulation so far this week but his scrambling and putting haven't been great and that just puts me off. Over at the Tour Championship, as many as seven players are within a stroke of the lead and it looks very hard to call. Here's the leaderboard with prices to back at 9:30. Maybe I was a bit too cautious yesterday because the one I liked after round one was this morning's favourite, Justin Thomas. He was around 9/1 after the opening round and he's less than half that price now but rightly so. I managed to get him onside in-running at [7.0] yesterday and right up until the 18th hole he was quite frustrating to watch. He looked to be playing better than he was scoring but he made up for plenty with this stunning approach and eagle putt on the finishing hole. The dangers are plentiful but not necessarily prolific and I like Thomas' chances from here. 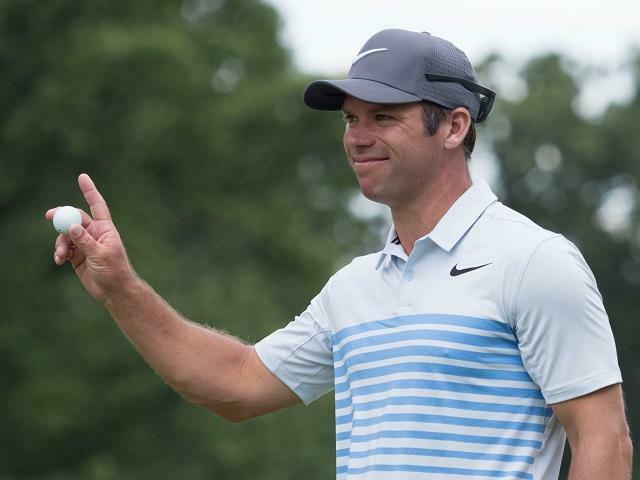 Paul Casey, alongside Thomas at the top, is very hard to fancy given he's still looking to register his second PGA Tour title, more than eight years after he won his first and Webb Simpson is looking to win for the first time in five years. He led by three strokes at one stage yesterday but once he found himself clear he was in trouble. He was very lucky not to drive out of bounds on the 12th hole, where he made a great up-and-down for par, but the reprieve was short-lived and a double-bogey followed at 13. Jon Rahm is a big danger but he never appears to represent any value in the market, Patrick Reed has flattered to deceive a number of times this year and I'm still not happy enough with Justin Rose's putting to side with him at a single-figure price. It's never wise to dismiss the phenomenal Jordan Spieth. He looked ragged yesterday after a missed tiddler on the first hole set the tone but he's only four strokes off the lead and if anyone can make up the ground, Jordan can. I've had a small saver bet at [18.5] but he'll need to find something from somewhere and his mate, Thomas, looks like the man to beat. A week after opening up his KLM Open defence in his homeland with four straight bogeys, Joost Luiten began this week's event, the Portugal Masters, with a seven-under-par 64 to share the lead with George Coetzee after round one. Just the latest chapter in the thickest of volumes - the frustration of punting on golf! I quite fancied Joost last week but he couldn't recover from such a tardy start and he missed the cut by one. It's a fast moving situation in Portugal now and the event usually takes shape in round two. It's a curious tournament to evaluate though because we've seen a couple of winners come from outside the top-10 with a round to go but Richard Green, who trailed by five strokes through 36 holes in 2010, is the only winner in the tournament's 10 year history to sit outside the top-10 at halfway. Green was tied for 11th and five adrift through 36 holes before slipping further back in round three and David Lynn was the other player to win from outside the top-ten after three rounds. He went from tied for the lead at halfway to six back and tied 16th before rallying with a superb 63 to take the title in 2013. Both Green and Lynn were matched at huge prices in-running and I'll be looking closely at who can close from off the pace after round three on Saturday night but for now it's largely a case of watching and waiting. Last year's winner, Padraig Harrington, made his move on Friday afternoon when he shot 63 to move from tied 12th and three off the lead to tied third and one adrift and they're the sort of figures required to get in to contention here. You go low or you go home. I'm going to be keeping an eye on the event all day today and if I add to the portfolio in-running I'll tweet but for now the only one I've added is Denmark's Lucas Bjerregaard. He did really well to shoot five-under par very late on yesterday given that the afternoon starters were disadvantaged to the tune of 1.71 strokes and I fancy he can get a shift on this morning before the moderate winds dry out the greens as they did yesterday. Over at the Tour Championship, Kyle Stanley has opened up a two-stroke gap over four players after an opening 64 on his East Lake debut and I'm going to play the waiting game there too. I was tempted to play Justin Thomas at around 9/1, given he drove the ball well yesterday and so much better than he did last week, but it's a job to know how he'll fare today. He again plays with his mate Jordan Spieth and I'm not sure that's a big plus. My only pre-tournament pick, Marc Leishman, was disappointing yesterday, shooting a one-over-par 71 but he's not completely out of it just yet. Phil Mickelson won this title in 2009 after an opening round of 73 saw him languishing down in 27th so there's still hope for Leishman from just seven adrift. I'll be back later at the close of play in Portugal and I'll take a more detailed look at the Tour Championship at the halfway stage in the morning.